- Page 97 of 100 - BookGateway.com - Your Gateway to Great Books! “Saving Cicadas picks you up in once place and puts you down in someplace else entirely.” I honestly have to say I agree with this statement. Please note that I also do not necessarily think this is a good thing. First and foremost, however, I have to applaud Nicole Seitz for taking on subject matter that is most often ignored. As a woman who struggled with infertility and lost a child, I am probably more sensitive to the subject of abortion than others. Nicole Seitz chooses to take this subject and tackle it head on. She does not shy away from expressing her complete distaste for this practice in the novel. That being said, she also does not spend the entire novel condemning her own character for making the decision once and considering the decision a second time. Seitz gives great insight into the struggle to make a decision as weighty as that one and also the grief and guilt that can come from choosing to abort a child as opposed to having him/her. From the opposite side, the issue I have with Saving Cicadas is in the execution. The transition from chapter to chapter was choppy and a bit confusing at times. Also, Seitz has a tendency in this novel to set up the end of a chapter with a climactic lead into the next, with the delivery of the climax falling flat. Once could have been overlooked, but she chose to do this multiple times throughout the novel. In addition, 8 1/2 year old Janie Doe Macy is wise beyond her years. The narrative in most of the chapters is intended to come from her point of view. As it was written, I had to keep checking to see if it the chapter was in Janie’s point or Mona’s, as there was no real differentiation between the voice of the two characters. If the majority of the story was to come from the eyes of a child, this mark between the viewpoints should have been more defined. In the end, I land on the fencepost in my opinion of Saving Cicadas. The first two parts are slow and were a struggle to complete, with the third part almost making up for it. Notice the almost. I usually recommend a book based on the likelihood that I will read it again. With only one third of the novel keeping my interest, it is not very likely that I would choose to read this a second time. The ending was fantastic but getting there was not half the fun. This book was provided free of charge by the publisher as a review copy. The publisher had no editorial rights or claims over the content or the conclusions made in this review. Visit www.thomasnelson.com for more information on this book. For the reader looking to get a picture of how God has touched us on Earth, Thomas Nelson Publisher has provided the NKJV Greatest Stories of the Bible. The book is arranged from Old to New Testament and uses the actual verses from the NKJV of the Bible to recount 250 “stories,” starting with Genesis and the beginning of the world and ending with our “Final Victory” in Revelation. As the book points out in the foreword, it is important to remember that this is not the Bible. While the entire book is comprised of verses from the Bible, it does still leave out most of the what you will find in an actual Bible. From a format perspective, that is what required the most adjustment for me when reading. I kept expecting to see verses with which I am very familiar, only for them to be missing in this collection. However, that is the point of this book. Thomas Nelson Publishers set out to create an “heirloom edition [that] provides readers with the tales of the Bible in an easy-to-navigate, storybook format.” I believe that they have achieved this goal. I am often concerned with devotions or companions that will interpret the verses in a way that does not hold to the true meaning or content of an actual Bible. By maintaining the format (NKJV), Thomas Nelson was able to alleviate those concerns for me. I was also able to locate the Biblical figures from whom I have found the most inspiration in my times of trials quickly and easily. The book is hardbound and comes with a ribbon attached to be used to mark a favorite story. It would serve as a perfect gift book for special occasions. Thomas Nelson also advises that it can be used to “improve family devotions.” I would only recommend this if you have a family with older children. I tried it on my younger son, who is still much more a visual than an auditory learner. As the book is entirely text, the stories were not very effective in holding his attention for long enough to finish one. Overall, I was very pleased with both the layout and the content of this book. I would certainly recommend it to others as a companion to their Bibles and an easy way to spend some time learning about how God has touched the lives of those who came before us. Ted Dekker along with Carl Medearis, his guide, and Samir, their man with the contacts, travel from Egypt to Syria and many points in between in an effort to sit with many of the ideologues of the Muslim world. The authors state that the goal is to find out what the important Muslims at each of the stops, be them Hamas or Hezbollah or unaffiliated (officially) think about Jesus’ teaching on loving our neighbors as ourselves. Dekker calls the book a travelogue and it is a fitting description as the book documents their travels in the Middle East, more than actually deals with the issue at hand, which is to say that the question of how important Muslim thinkers and influencers think Jesus’ teaching fits with their agenda and actions. Each of the conversations that Dekker has with each of the Muslim leaders is shared verbatim in transcript form so that there can be no issue of out of context quotes or agenda driven choices of quotes. There are parts of this book that are absolutely fascinating. The history and perspectives were, in many cases, completely new to me even though I consider myself well read on current issues. On occasion, Dekker would go into depth on the history of a specific area and how the temples to such and such god were taken over by the Jews, then the Christians, then the Muslims. I also found the transcripts to be fascinating in that I gained insight into the background and character of those being interviewed. Unfortunately, I found that the book didn’t actually answer the question posed in the introduction. I found most of Dekker’s worrying about going into the dangerous areas to be whiny. I get that he was scared, but he went for a book so I found that I didn’t connect emotionally with his plight. If he had gone for a more altruistic reason I may have cared more. I also found the story of Nicole to be distracting. Sure it was an interesting aside, but I read this book to hear from the leaders of the Muslim world about the idea that we are called to love our enemies and I just didn’t get that. In fact, the biggest let down in the book were the interviews. Dekker had an opportunity to discuss non-violence and love with very influential Muslims and he spent most of the interview asking inane questions like, “What is a joke that makes you laugh?” and “What kind of car do you drive?” The important questions came only at the end and little or no follow-up was made to them. I understand that Dekker is trying to humanize our so-called enemies so that we can do a better job in loving them, but I felt at times that humanizing them with the shallow questions did less to answer our concerns than to fill the pages of a book. An interesting read that ultimately fails to deliver on its promise. Scott Asher is the founder and administrator of BookGateway.com. Along with his contributions to BookGateway, he reviews for the commercial site BuddyHollywood.com. His personal blog is AshertopiA – a land flowing with milk and honey… and a lot of sticky people where he cartoons and writes on anything he finds funny and Christianity, which sometimes overlap. In the course of the investigation, the body of Councillor Faust is found at Maria Geburt church. He has been decapitated in the same manner as Brother Stanislav. The only clue at both crime scenes is a patch of black sticky mud. Dr. Lieberman uncovers that both Stanislva and Faust were vocal members of a shadowy anti-Semitic group. Could the Jewish population, especially the Hasidic community be responsible for these crimes or had the Jewish golem, a legendary figure, arisen? The investigation soon becomes personal for Dr. Lieberman. His privileges at the local hospital are suspended and he is on the verge of losing his medical license. After the third decapitated body of Jeheil Sach, a local pimp, is found, Dr. Lieberman turns to the Hasidic Jews to find answers. The question is why had the Jews killed one of their own? What transpired in the investigation as Dr. Libermann searches for answers leaves you in suspense. Tallis keeps you turning pages as he weaves his intrigue and brings the story to the final conclusion of who or what committed the crimes. However, it is very difficult to keep your focus as the plot jumps from subject to subject. Tallis has received many accolades for his work, and his fans will definitely want to read this one. 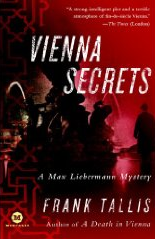 However, I do not recommend Vienna Secrets for first time reader of Frank Tallis. Mary Asher, the Golden Reviewer, is a founding book blogger for BookGateway.com. She describes herself as “An 80 year old avid reader reviews the newest in Christian fiction and non-fiction with a sprinkle of the secular on top.”. Joshua Harris takes the well known, but not well understood, parable of the builder (who builds his home on the sand vs the builder who builds his home on the rock under the sand) and applies it in a rich and insightful way to our understanding of Christian doctrine and theology. Dug Down Deep calls the reader to a deeper understanding of Christianity; to the why not just the what of our belief. It is a call to a firm foundation that will lead to a revived love for and appreciation of God. Each of the chapters in the book, after the first couple which serve to introduce us to the topic, go into greater depth on a specific orthodox theology, explaining why it matters and how we apply that knowledge to our walk with Christ. In reading this book I found a balance between head knowledge and its affect on heart. Too many times I have seen someone go to the extreme on either side. I’ve seen people go too far to knowledge side where they know so much about God but they may not actually know God, and I’ve seen the opposite where people experience God but have no idea what their experiences mean. This book is a great resource for those in your life (including yourself) that fit into one of those categories. John Ankerberg and Jimmy DeYoung come together to create “Israel Under Fire: The Prophetic Chain of Events That Threatens the Middle East,” a book that promises to explain the Biblical predictions concerning the current events in Israel, how what happens in Israel affects the rest of the world, and answers the age old question, “Will there ever be peace in the Middle East.” To come to these answers Ankerberg and DeYoung interview – on location in Israel and the Middle East – many of the policy makers and experts who would be close to the situation, such as, Benjamin Netanyahu, the prime minister of Israel and Reuven Rivlin, the Speaker of the Knesset in Israel. Ankerberg and DeYoung are less authors than interviewers for much of the book (and interviewees, as I will explain.) The authors claim that the book will answer questions and give a Biblical basis for the current events in Israel. To accomplish these goals the authors provide a brief history how the modern state of Israel came to be and what exactly is currently happening in Israel. On these points, I found that the authors were successful. Unfortunately, this was only one part of the book. In the second part of the book, the authors interview current world leaders and here is where I feel the book goes awry. I had two issues here. First, the authors advertise on the back cover that they interview Adnan Husseini, Yasser Arafat’s cousin and Palestinian Authority spokesman. While, it is true, it is a little misleading as he is one of three world leaders advertised yet he appears in only one very short section with only a couple of questions, while the others leaders, Jewish pundits exclusively, are interviewed extensively. This is far from balanced coverage. Second, the authors didn’t just interview pundits they agreed with – they also interviewed each other. I understand that the authors may be experts in a field but their opinions should be bolstered by other expert’s opinions, statistics, reports and the like. Author’s opinions should not be proved by their own opinions. The issue of lack of documentation and proof isn’t just relegated to their opinions in interviews. Unfortunately, the authors take comments and opinions from pundits they agree with for granted, moving right past controversial quotes that cry out for data that reinforces the opinion. The only reference in the book to an outside source (other than the Bible) is on page 156 (of 174). In the third section of the book, the authors attempt to tie current events with Biblical prophecy. I would expect that anyone, after reading this book, even someone who has no experience with Biblical prophecy or current events, would be able to walk away understanding the “prophetic chain of events that threaten the Middle East.” What I found in this section, though, was confusion. To explain a complicated book like Revelation, I would expect we would start at the beginning and work our way through the (purported) time line from start to finish. I would expect that current events would be tied in to the timeline to show how the events fit into the puzzle. I would expect that the authors would show how these events work together to fulfill prophecy. Unfortunately, Ankerberg and DeYoung did not make a convincing connection for me. While I did find the first section of the book interesting, this book left me unsatisfied in my search for connections between current events and Biblical prophecy. Revelation itself is already difficult to understand and I found the authors didn’t accomplish their goal of making it accessible and understood by the reader. As much as I would have liked to, I cannot recommend this book to anyone but Bible prophecy buffs. Andrew Klavan writes The Long Way Home in the first person serving to bring home the personal turmoil that the main character lives with. Charlie West, a 17 year old high schooler, who previously lived in a small town with his parents and sister, is on the run. He went to bed one night and woke up one year later accused of murdering his friend Alex and being a terrorist in an organization called “The Highlanders”. Charlie was found guilty of murder and sentenced to prison. With the help of an unknown benefactor he excapes from prison and is running from the police and the Highlanders. Charlie cannot remember what transpired duiring his lost year. He wonders if he really is a murderer and a terrorist. How can he prove his innocence and who is really behind all this? Was he framed, as his friends say, or did he really do these terrible things? Charlie returns to his home town, holing up in a vacant house called the “Ghost Mansion”. He teams up with his friends Rick, Josh, Milner and his girlfriend Beth to discover the truth about the murder he can’t remember and who is behind the Highlanders, a terrorist group. The author keeps you turning pages as you eagerly anticipate answers to these questions and to see if (and how) Charlie will evade the police and the Highlanders. The book is well written and interesting, and ends on a cliffhanger. Overall, this is an exciting mystery novel that keeps the reader interested in the outcome partially due to the first person perspective and partially due to the constant chase that Charlie finds himself in. A fun book for mystery readers. If you are new to this series, you must read the first book of the series to see what transpired in Charlie’s life to bring him to the situation he finds himself in at the start of this book, book 2 in the series. Charlie’s story continues in Book 3 – The Truth of the Matter. Like Shaunti Feldhahn’s previous works, the Male Factor is commentary based on surveys. I was introduced to Feldhahn’s work through For Men Only: A Straightforward Guide to the Inner Lives of Women, which I found to be very helpful in understanding my wife and her needs. And though I am a man interested in women, I also read For Women Only: What You Need to Know about the Inner Lives of Men to see how accurate I found the survey information to be. I found that Feldhahn was spot on and the surveys incredibly insightful. Now with this book, we get the same insightful information but based on surveys focused on the work environment instead of the home. As a man in the business world I found that the survey was right inline with how I see the workplace and / or how I know that my male peers do. I imagine that if a woman was to read this book and implement some of the suggestions that they would immediately find their male peers much easier to work with and her job much more enjoyable. (In the same way, I look forward to the upcoming partner book, which will focus on how males can function better at work with females.) Interestingly, this book also sheds light on some of the weaknesses in the way that men function, and while reading I found that I could benefit from changing my worldview as well. Another solid book that I recommend to all business people, male or female. J.D. Blackstone is perfect. Well, except that he can’t sleep. He has multiple degrees, knows everything, is in great shape, rich, a professor and lawyer. He drives a Maserati convertible. He has an attractive partner at the law firm and soon after the start of the book he has an attractive and very interested defendant. If this book was somehow filmed in black and white J.D. couldn’t have been more stereotyped. The damsel in distress. The forgetful professor of religion (he forgets when he dropped off his dry cleaning. Really?) The tough P.I. who can get any information you need with just a few calls to his contacts. Everyone in this book is a stereotype! And yet, I found that I enjoyed the book. This crime drama is fast paced, detailed and fun. The Booth diary and the Freemasons make for a fun setting for this mystery. Are we ever very surprised? Not really. But that’s something we can say of nearly every crime / courtroom show on TV yet we watch those. The Rose Conspiracy is an enjoyable diversion that keeps the reader interested throughout. Dr. David Jeremiah says that the angel craze “peaked in the 90s” (p14) so the question of why this book was written is a justified one; there must be a pressing reason to release another book on the subject. What I found was that there really isn’t a pressing need other than the author’s desire to publish his opinion for a new generation. This is not to say that this is a bad thing. Many times a topic may have been done before, and even better, but a new generation may read this newer version and be introduced for the first time to the topic. Angels is a book like that. I found the book most helpful when I considered it a resource rather than a standard non-fiction treatise. Chapters like, “Showing Us How to Worship,” “The Angels and Us: How Much Alike,” and “What Angels Are” are great resources for those with questions or putting together a sermon or study. The chapters are Biblically based with scripture and also references to some of the previous works on the subject. The book is an easy to read, interesting study of angels for a new generation. I recommend it to those who have an interest in angels either for themselves or for someone that they know that may have unorthodox notions. Newt Gingrich, former Speaker of the House of Representatives, takes us on a walking tour of the nation’s capitol – Washington, DC. The touch begins with The National Archives, Washington Monument, the Memorials of Jefferson, Lincoln, Vietnam Veterans, Franklin Delano Roosevelt, the Capitol Building, Supreme Court, Library of Congress, Ronald Reagan Building, The White House, World War II Memorial, and last but now least, Arlington Cemetery and the grave of President Kennedy with the eternal flame. Gingrich give a small dissertation of the history of each and the trials and tribulations encountered in the building of these historical buildings. This book, in part, is a history lesson of America. Gingrich clearly describes our founding father’s faith in God. From our first president, George Washington through George Bush II, God has played a mayor role in decisions made by these men, Washington at Valley Forge, Roosevelt’s “fire side chats”, Eisenhower’s prayer on the beaches of Normandy on D-day, Kennedy’s famous speech -“ask not what you country can do for you, but what you can do for your country”. Our country is founded on the principle that “all men are created equal with certain unalienable rights…” The Declaration of Independence, the Constitution and Bill of Rights all stress the importance of the invisible hand of Almighty God. The novel is not written as political, but spiritual. Gingrich points out that our founding fathers knew that power came from God and that a nation cannot survive without God. Faith of our presidents and their devotion to God is clearly depicted in their speech3es, scriptures carved in and on all the monuments and buildings that make up our nation’s capital. He also points out that our founding founders established our nation to be a nation “under God”. The secular Left’s relentless effort to drive God out of America is succeeding at an alarming rate. The Supreme Court ruled we can no longer say “under God” in the Pledge of Allegiance. The writer points out that we are allowing five people to completely change the structure of America. The book is not intended to be political, acknowledge any particular religion, but is spiritual in context. Ir clearly warns us that we must stand up for God and our believes or lose our rights as a nation under God. Callista Gingrich’s photography throughout the novel is outstanding. I am reminded of Jefferson’s immortal words in the Declaration of Independence that all ” are men are endowed by their Creator with certain unalienable rights…” and the inescapable truth that freedom is strictly from God’s grace. Don’t let it slip away. Good read – will renew your faith in God. Gingrich did an excellent job.